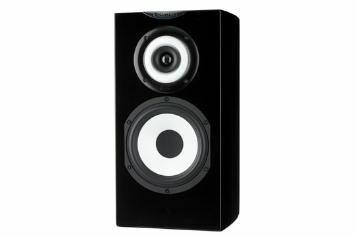 Cabasse Minorca MC40 review | What Hi-Fi? First things first – the £720 price we're quoting here refers to the wood finishes offered by Cabasse. Our review sample, however, arrived in a lovely glossy black, which ups the price to £900. Either way, your money buys you a substantial 3-way standmounting design with a version of the coaxial midrange/tweeter arrangement Cabasse has been perfecting these past 50 years. The tweeter sits inside a midrange driver, which theoretically offers wider, more consistent sound dispersion, and that's mounted above a 17cm mid/bass cone. At the back is a bass port and speaker binding posts. Even if you were tempted, it's unlikely you'd have a shelf in your house deep enough to accommodate the Minorcas, and your choice of stand is even more critical here than usual – their impressive size means the stands will need large top plates, and will need to be robust, heavy and inert enough to support these sizeable boxes. Spirited and engaging, the Minorcas sing with a lively, detailed voice that extracts gratifying levels of detail, particularly from the midrange, and lays everything out on a soundstage that's simple to visualise even from quite a long way off-axis. Van Morrison's Jackie Wilson Said is engaging – these speakers are on a mission to entertain, and in that respect they're pretty successful. Shortcomings are few, but significant. There's a void between the bottom of the midrange and top of the low frequencies that the Minorcas can't disguise, and below there a definite lack of substance and positivity to low-frequency information. It doesn't stop these speakers from being a fully energising listen, but it does stop them getting a fifth star.